I almost went out on my bicycle yesterday. It would have been very appropriate, three months and a day since my crash. I got a new helmet on Saturday (November 1st) to replace the one that took the brunt of the impact last time out. I decided to get the exact same helmet as before. I reasoned that as the previous one did such a good job, why change ? I did not go out as it was very wet and incredibly windy. Not ideal cycling conditions really and certainly not good conditions to take the first steps after a major crash. Recently I have been able to kick-start my fitness a little by cycling in the gym and moving some (very small) weights around. This has only really been possible since my latest surgery a few weeks ago. Previously I could barely lift my arm, let alone hold a weight while lifting it. Things are certainly improving quickly now. The road back to fitness looks like it might be a long one though, certain arm movements are very difficult. I have a very reduced range of motion too, which makes shoulder presses almost entirely impossible – anything that pushes my arm too high hurts and it carries on hurting for some time afterwards. Just the simple ‘pull tee-shirt over your head’ move is seriously painful. The scar is healing well and the stitches have all fallen out now. 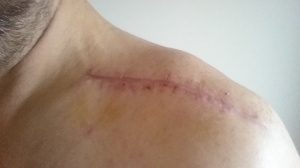 The downside is that the shape of my shoulder has changed a little and the trauma suffered by the muscles and nerves in my shoulder means that the stabilising muscles need to re-learn how to, well, stabilise my shoulder when I am using it. So I have a number of exercises that I need to do each day and a small number of weight based exercises that I can do at the gym. This is tiring and painful, but it could be a whole lot worse. At least I can move it, I can ride my bike (I think), it did not entirely fall off. There is little to report on the claim front. The driver of the car was uninsured at the time of the crash. He was driving his daughter-in-laws’ car. The car had a valid insurance policy attached to it, but it was not an any-driver policy, nor was he named. In this instance the insurance company will deal with my claim, then look to recoup whatever the claim costs them from the driver. While my solicitor has been communicating with the company, it seems that he is not communicating with them at all. He has ignored their letters requesting a statement of what happened. Very soon it will be too late for his side of the story to be told. I honestly was expecting him to say that he was innocently parked in the middle of a busy roundabout and a crazy cyclist crashed into his door. So things are looking up, finally. The physiotherapist has cleared me for riding my bike and engaging in light sports such as badminton now, so at least I will be able to work on my fitness a little…..
Physiotherapy is akin to torture. I hate it. I know that it is necessary, but I hate it. I am in serious pain, muscles in my arm and shoulder are spasming and it is simply terrible. My ability to put my hands behind my head has returned – I have to lean a long way forwards, but it shows that I am gaining mobility. Also pleased to hear you put common sense up front and stayed out of the wind and rain over the weekend. We had some of that in Los Angeles, oddly. Back to sun again today though. Keep up the virtuous improvement routine. Crash – Recovery Month Three I have a love-hate relationship with Apple and Android….